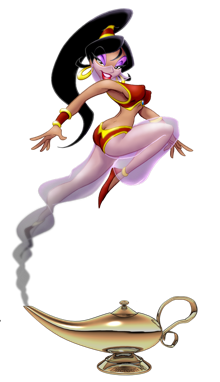 Aladdin4D is a software program for modeling and rendering three-dimensional graphics and animations, for the Amiga platform. Aladdin 4D was originally created by Greg Gorby at Adspec Programming in Ohio. The 3D program was then acquired and updated by Nova Design, Inc.
Nova Design added many modern features and made it easier to use. On December 17th, 2007 Nova Design sold all inventory, source code and intellectual property rights to DiscreetFX LLC. DiscreetFX is updating and releasing a new 6.0 version for Mac OS X, AmigaOS 4.x, MorphOS, AROS, Linux & Windows. The Windows version of Aladdin 4D will never be sold stand alone. Instead it will be included for free when you purchase the product for one of the other operating systems. Aladdin 4D's Virtual Character Product Representative. Aladeena is a trademark of DiscreetFX and can't be used without permission. A-Eon Technology Ltd is allowed to use Aladeena solely for the purpose of promoting Aladdin4D (any version) or the AmiStore App store. - Infinite layering of surfaces: A surface of an object may have a virtually infinite amount of textures, shaders etc layered on it. - Importing of most postscript files, making the creation of logos easier. - Unlimited number of working layers: multiple working areas containing only a portion of the scene, easing out the management and pace of objects during the creation of animation. - Gaseous volumetrics with adjustable mass. - Built-in particle system to simulate various effects like fireworks. - Morphing capabilities in the animation system. Also, Aladdin 4D has advanced rendering features like motion blur, multiple pass supersampling, lens flares, 32-bit color support and a highly optimized 68k rendering engine. Aladdin 4D supports the following 3D formats: Aladdin 4D, Lightwave3D, GEO, EPS, DEM, Draw4D-Pro and Draw4D, 3D Studio for either loading or loading and saving. Image Formats supported for loading and saving: IFF/ILBM (palette mapped and 24-bit formats), JPEG and Video Toaster Framestores. Aladdin 4D supports exchange of data with ImageFX, Amiga Lightwave 3D/Video Toaster, World Construction Set and all programs that support Nova Design's "Magic" protocol for buffer sharing. Aladdin 4D latest version runs on any Amiga platform or an emulated one, like Amiga Forever, UAE (including WinUAE & E-UAE), and also on the Draco and Pegasos or Mac Mini G4 systems running MorphOS. Aladdin 4D is a entry level, easy to use beginners 3D animation software package. Customers that want the latest tech in 3D animation / modeling / rendering software should purchase NewsTek's Emmy award winning LightWave 3D 2018. Aladdin 4D 5.x works with FPGA Amiga's, classic machines running Amiga OS 3.x or Amiga Virtual Machines via Amiga Forever or WinUAE/P-UAE/UAE. It also works with MorphOS, Amiga OS 4.x & AROS. Please note that Aladdin4D's fate is now controlled by two companies. Read the press release below for more information. A-Eon Technology Ltd has full rights and source code to develop Aladdin4D on the three platforms listed below. DiscreetFX's version of Aladdin4D 6.0 will work native on the platforms listed below. Windows (Never sold!, instead included free with purchase of a version for other platforms). The Windows version will not be a Metro/Modern App and will work best with Windows 7 & 10. It may work on Windows 8 but won't be tested or support for that OS version. It should also work on Windows XP but has not been tested on that OS. Aladdin 4D 6.0 Current Multi-Platform Status listed below. 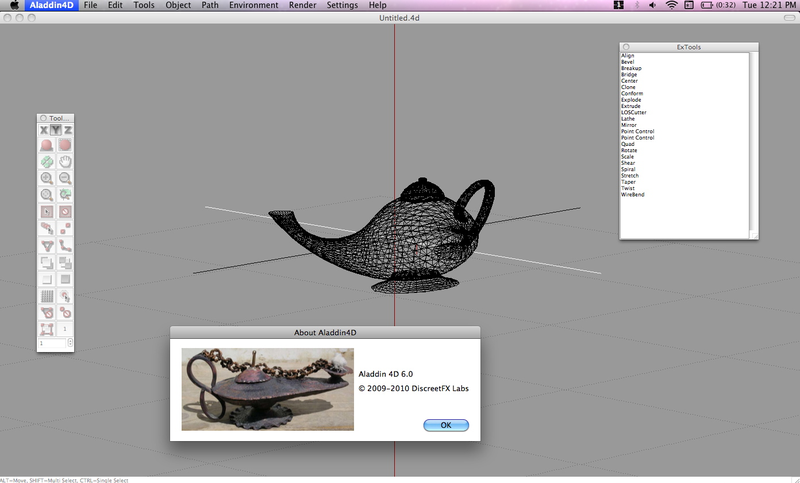 Aladdin 4D 6.0 macOS Stable Release 6.0.0.26 (Internal Beta) / Janurary 17th, 2013. Aladdin 4D 6.0 AROS Stable Release 6.0.0.27 (Internal Beta) / February 2nd, 2014. Please Note - Over 3000 man hours of development time have gone into the coding & updating of Aladdin 4D 6.0. Aladdin 4D is being modernized and brought into the 21st Century. © Copyright 1995-2019 DiscreetFX LLC All Rights reserved. All trademarks belong to their respective owners.